Hi and welcome to my stop on the Peachy Keen Stamps August Release Blog Hop. Today I am sharing some fun party projects that you can use for a fun Halloween party. If you have come from Emily Kluender's blog, you are in the right place. If this is your first stop on the hop and want to join us for some fabulous inspiration and a chance to win some Peachy goodies, hop on back to the Peachy Keen Stamps blog to get started. I also used the Happy Halloween Background stamp on some cardstock that I wrapped around the bottles. To finish off the bottles, I added some fun tags that I decorated with the new August Stamp of the Month stamp set. So, what do you think?? I hope that you have been gaining some wonderful ideas along the way of the hop. Don't forget to leave a comment for a chance to win a $50 Gift Certificate to Peachy Keen Stamps. You get an entry on each blog you leave a comment on. You have until August 6th to leave your comments. You can check out all the details over on the Peachy Keen Stamps blog. You have now reached the end of the hop. I hope you were able to get some great inspiration this week with the new Peachy Keen Stamps release. Don't forget to leave a comment for a chance to win. Good Luck!! Sweet skeleton invites! Too cute. Great invites! I want to come to your party!! Those bottles are awesome! fab creations... I really love the idea of decorating even the soda bottles... very cool. Amy, this is such a fun way to decorate for a party! Love the soda bottles with their tags and that pose-able skeleton is just so cute! Well these are just adorable.... Love the soda covers!! I'm a tag-a-holic , so you know I'll be tagging away!! Thanks for the inspiration! Super Fun and way too CUTE!! Awesome soda covers and I just love the SUPER fun cards! Super cute projects!! I love those poseable skeletons!! What a great way to decorate some bottles!! That is a great party set. I really like how you used the background stamp on the bottle labels. 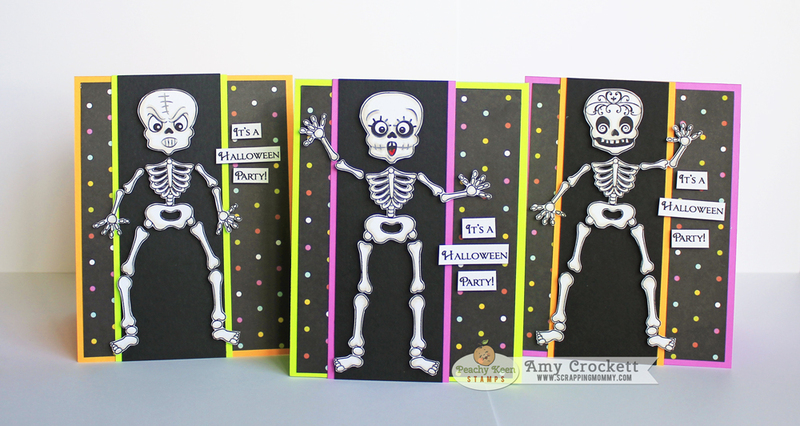 Fabulous...love the skeleton cards and the cool bottles!! Fabulous invitations and love the bottle decorations!! Great idea for the drink bottles. Your skeletons are super cute. Just adorable. You did a fantastic job. The invitations are wonderful. Wow, am loving your cool party ideas. These stamps are awesome. Love those invitations. And that paper/color combination is perfect. 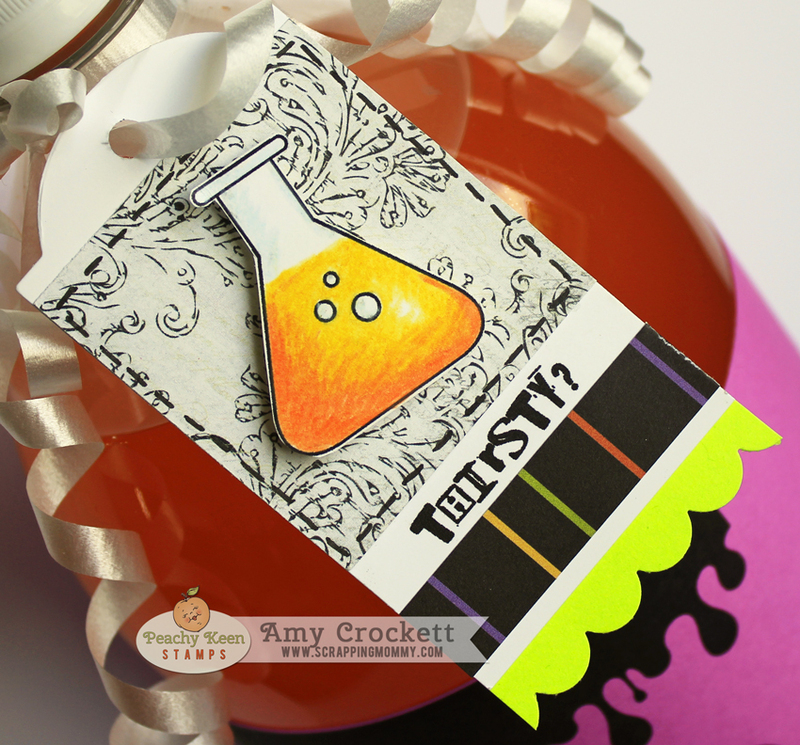 Your Halloween Invitations & The Wraps Around The Soda Bottles Are Too Cute!! It's going to be a fun party. I love the skeleton. He will be such fun changing the way his body is moved. The invitations are great and the covers for the soda bottles are a clever idea. thanks for sharing and inviting me to the party. Really like the Skelton invites. Great job! 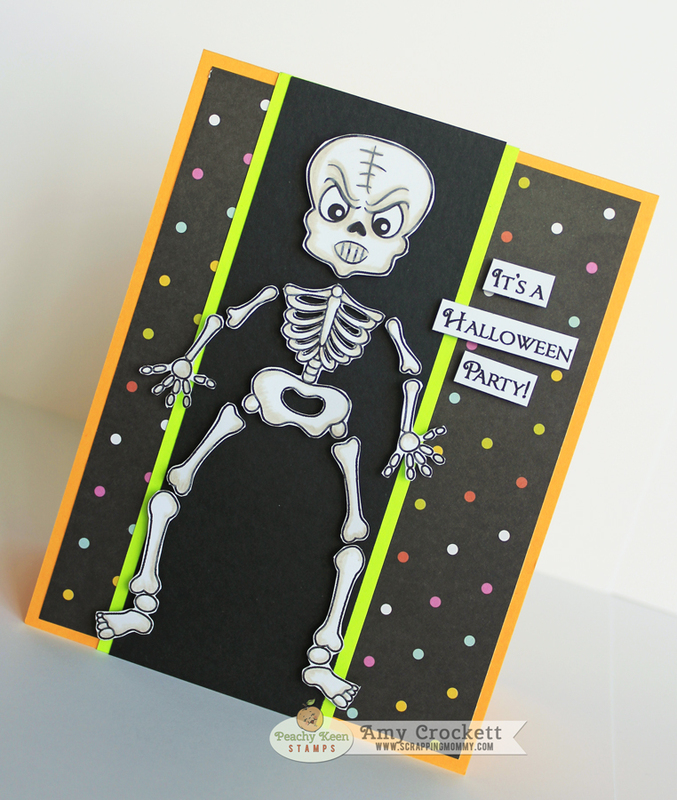 Your invites are adorable...I like that the skeleton can have many looks and the neon colors on your projects are so pretty. Clever idea for decorating the bottles...very cute! Fabulous job! Thanks for sharing your wonderful party goodies. What fun. Super fun invite and bottle wrappers, very creative. Wow such a great way to decorate the coke bottles!! Love the cards too! Great hop and tons of inspirations! Thanks!!! I would definitely come to your party. Love this stamp set and all of the fun projects! Love your projects, great idea for the soda bottles!!! 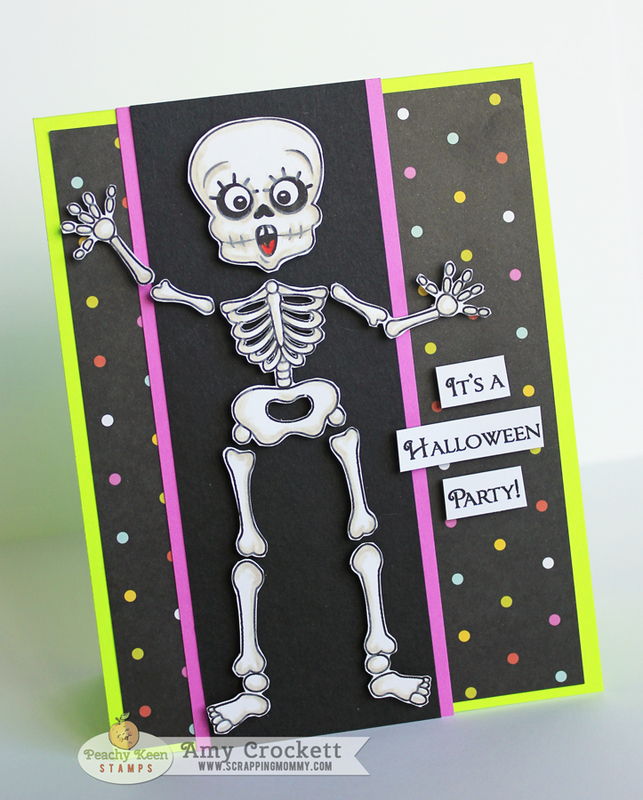 Great party invitations with the poseable skeleton! 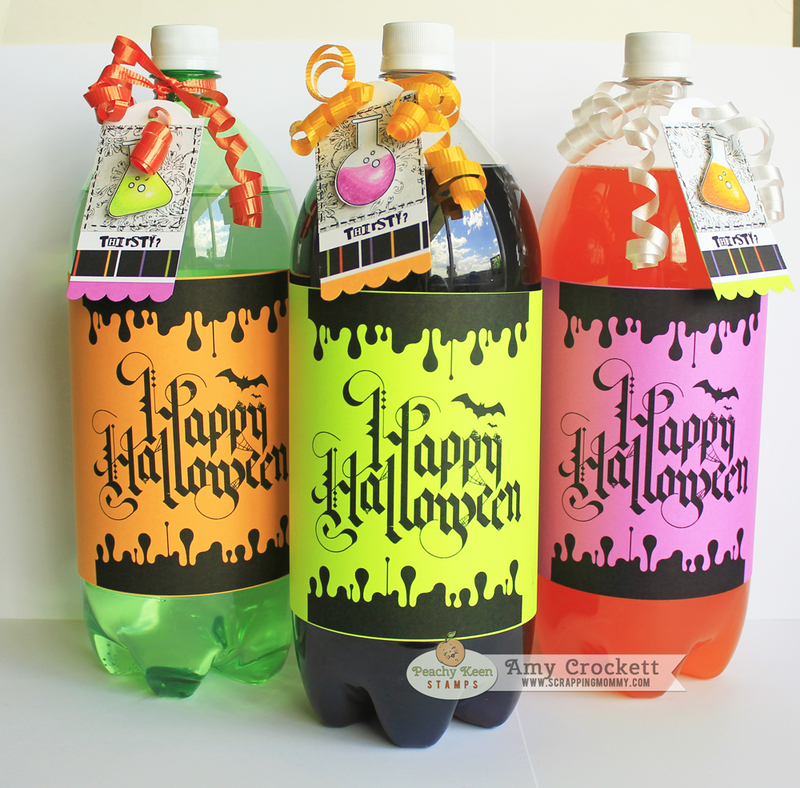 Also wonderful idea with the Happy Halloween background stamp on the soda bottles! Such ingenious ways to showcase this new release! Fun in every detail!! These are really great cards! LOVE them all! I like what you did with the bottles too. Ooops! I love the invites! Those tags are so cool. Great projects! The soda bottles are so flippin awesome!! What a creative and fun way to use that background stamp.... I totally love it!! 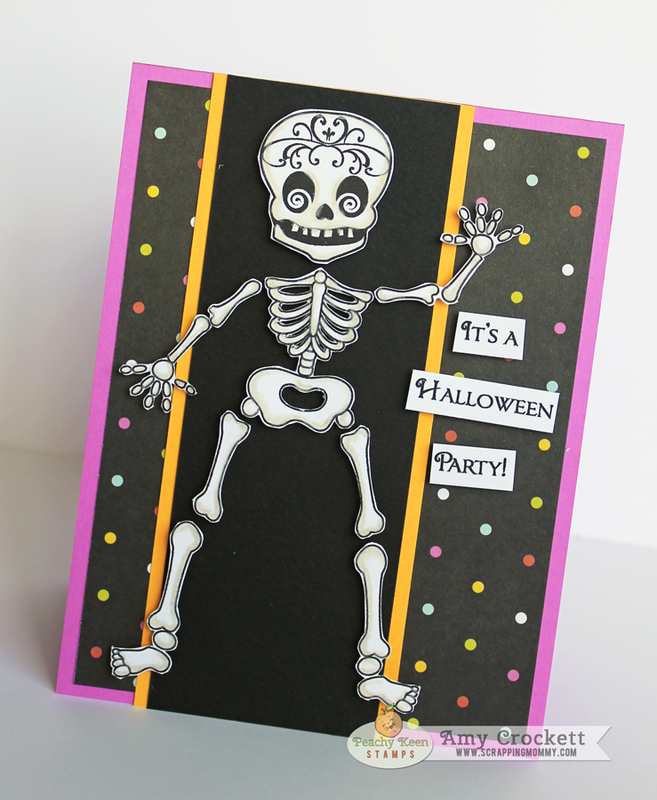 Your invites are fantastic too... love all the different skeletons!! You did an amazing job!!! Amy I love that you decorated the soda bottles. What a great idea. TFS! Ok....too cute!!! I think the skeletons are my FAVE!!! But those bottles and treats are just so fun!! Great job Amy! Can't wait to get my goodies! !